Global mining supplier Getman enlisted RCT to provide a mobile, Teleremote control solution for an A64HD Water Cannon, bound for its client in Indonesia. RCT Custom was enlisted for a bespoke solution that would allow the client to control the Water Cannon from a safe distance with all the same functionality as if they were driving it from the cab of the machine. The solution had to be flexible enough to allow the operator to control the machine from various locations onsite. The end result was the ControlMaster® Portable Teleremote solution, which allows the operator to conveniently set up operations at a safe distance, where required onsite. “The flexibility this solution provides ensures that the machine can access all areas of the mine site it is needed to carry out the job safely and in a productive manner,” said RCT’s North America’s Regional Manager, Andrew Sells. 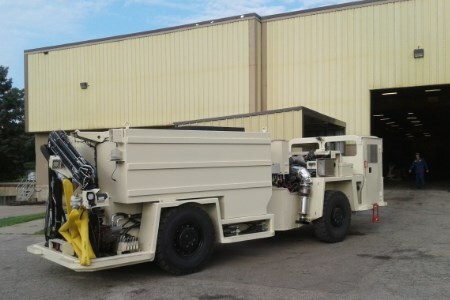 RCT Custom designed and manufactured the solution to allow operators to tram the mobile machine and use the Water Cannon boom control via remote control. Operators can see the working area clearly by utilising the cameras on board the machine which relay vision of the machine’s movements to the operator via the Portable Teleremote solution. RCT’s US branch completed the install at Getman’s HQ and our permanent technician based at the end client’s mine will provide ongoing maintenance and support for the solution.